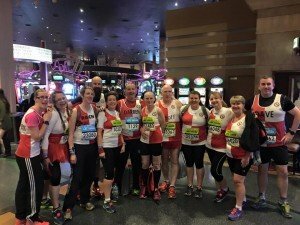 I’m often quoted as saying I’d never run more than 5k so when I went online to book a 10k and ended up booking the Las Vegas half marathon, it was a surprise! With 11 Massey mates and an array of guide books, we made great preparations for the fun stuff – hotels, food, cocktails, concerts etc. So much fun that I kept forgetting I had to run 13.1 miles half way through my ‘vacation’. When I did remember, I mostly felt torn over how to approach the race. Having peaked at 11 miles in training, everybody told me I’d be fine but as a new runner, I doubted them (and myself! and my trainers!) Should I go flat out, fast as I can? Should I hold back, just in case? What’s half way between these 2 things? After lots of shuffling in the corral, I finally crossed the start line at 17:15 and instantly felt much calmer. The rain was driving down for the first 5k and there were strong winds throughout (reportedly over 30mph) but it was easy to ignore with the noise and lights of LV. The route was flat and seemed to be virtually a straight line down the Strip. I spent the whole race whooping and cheering, high-fiving spectators, touching hand-made posters for ‘instant power’ and singing along with the bands and DJ’s en route. For 7.5 miles, I ran at my most conservative pace, mostly through a pre-instilled fear of collapsing, tripping or injuring myself but at 8 miles, I thought ‘oh blow it, I’m off’ and sped up to a pace a little more challenging for me. At 10 miles, I saw 4 of the MFRC girls in the distance so I had a sprint to catch them up – they were further away than I thought by the time I’d weaved in and out of the other runners (and walkers. 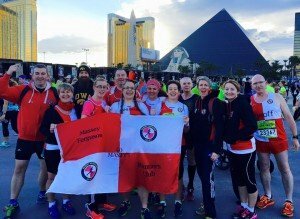 This race attracts a strong walking crowd) Heading into the last 3 miles, I had to do a lot of weaving but as the route (which had taken us briefly into the darker, duller streets) turned back into the hub of Vegas, I just kept thinking ‘1 more Parkrun’!